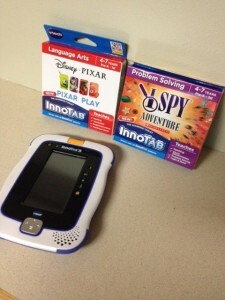 VTech makes all kinds of awesome toys for the kiddos. One that Cooper has really loved is the VTech Innotab 3. We had the privilege awhile ago to review this tablet and Cooper just loves it. So now we got the chance to review 2 new cartridges for the Innotab 3. We had the chance this time to review 2 cartridges, Pixar Play and I Spy. Both of these Cooper has spent hours playing. Pixar Play has characters from Monsters Inc, Toy Story, Incredibles, and Finding Nemo. All of which Cooper loves. His favorite is the Incredibles. I Spy is just that! This is a great game if you need a good logic game and lots of great visuals. What I love the most about VTech is that Cooper enjoys them if if they are below the age group on the box. So don’t be afraid to buy something based on that. Cooper is a bit behind in school because of his ADHD so it all makes me smile when he plays these fun games because I know he is learning. Add this to your Christmas list for the kiddo in your life and you won’t regret this purchase. The VTech product, gift card, information, and additional gift pack have been provided by VTech.